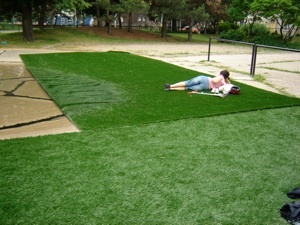 True Reflection was installed at Vermont Park wading pool and North Stanley Park pool in Toronto. 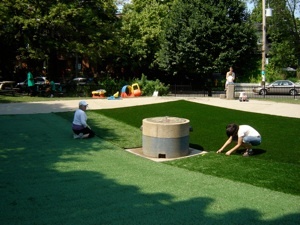 SuperGrass™ was installed in the cement wading pool and then the pool filled with water. With the artificial turf the pool became an alluring oasis. The use of materials commented on how the experience of the wading pool relies on manufactured rather than natural elements to recall nature and create the sensual and alluring experience of a lake on a summer day.